In addition to landscaping plants, other simple deck ideas and designs include décor such as seating, storage or dining sets. A small dining table is a great addition to any remodel or renovation by making your deck more functional allowing you to not enjoy meals with your friends and family. 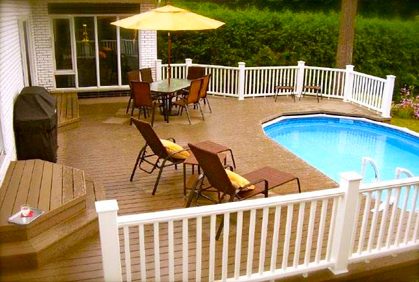 For those homeowners with a pool in your yard, consider adding a deck around the perimeter. The latest trends and ideas for above ground pool decks include a full surround, side, or combination deck. A full surround deck is one of the most popular plans because it encircles the entire pool, providing you with a large area for sunbathing and lounging. Patio umbrellas provide an easy diy portable roof for your deck that can be freestanding or incorporated into a dining table set. Adding an umbrella is a great and functional way of decorating a small deck because they add a splash of color to the area as well as protection from rain and sun. Arbors and pergolas, on the other hand, are open lattice structures that act more as decoration and provide a little bit of shade. The best pergola designs for decks often cover the entire space and incorporate seating, outdoor curtains for added privacy and shade, or hanging plants for a natural decoration. Take a look at our photos of small decks with pergolas to help get some inspiration and design ideas for your remodeling project. Container gardens are also a great decor for Whether you are looking for today’s hottest trends in outdoor decor or great landscaping ideas on a budget, we are your top resource for creating that next beautiful backyard makeover. Here you will find the top backyard design ideas in 2019 and pictures along with expert do it yourself tips to help you to make that dream landscape a reality. with decks and add a beautiful look to the space with bright, colorful plants, vivacious shrubs, or luscious fruits and vegetables. When creating a container garden on your deck you can choose from pots, hanging planters, or raised beds. Small decks are especially useful for home with little space because they add an extra room, allowing you to expand your living area to the outdoors. Not only do they increase the value of your home, but building a small deck in your backyard can provide you with a space for a little container garden or an attractive dining area for your guests. 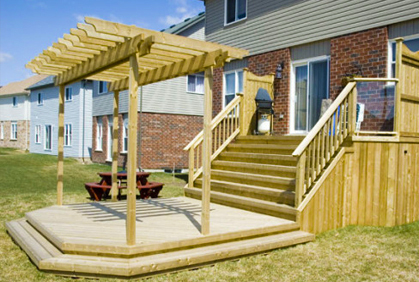 There are a variety of small deck plans to choose from, including simple plastic set ups and ornately carved wooden constructions, or simple 2 level decks. When planning a deck, make sure to base the design off of the style of your home and landscaping. Whether you are remodeling an existing deck or starting from scratch, it is important to create a design scheme that flows beautifully, blurring the boundaries between the interior of your home and nature. 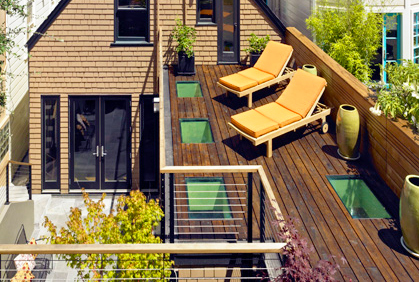 The first thing to determine when building a small outdoor deck is the design. 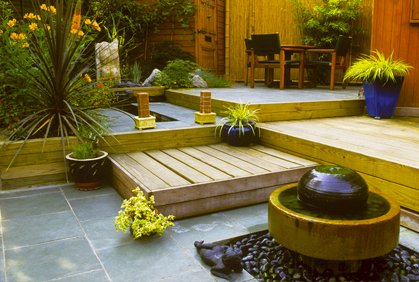 Despite the lack of space, there are many different style and layout options to choose from when you design and build your deck. Popular small deck ideas make the most out of the available space with simple and sleek designs such as beautiful wooden structures, plans with combined seating and storage, or unadorned patios. 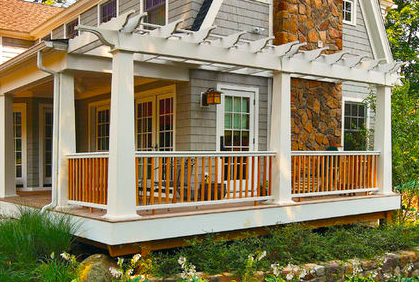 There are two main options to select when designing a deck- covered or uncovered. Covered decks are popular because they provide you with a space that can be used year round, no matter what the weather. When you have a roof or some type of covering over your deck you are protected from rain, snow, and to much UV rays from sunlight, extending the use of the space as well as preventing unwanted damage. When dealing with a small outdoor space, putting a roof or covering over top of it can make the area appear smaller and more claustrophobic. Small patio design plans that are best for small areas should have an open design, preventing overcrowding and creating the illusion of more space. For those homeowners with a deck that is level with the ground, consider opting out of installing railings on the structure. 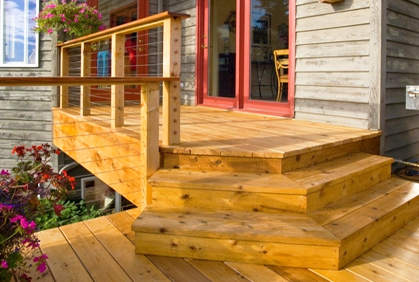 Without railings the deck will blend well into your yard, thus providing you with more space. If you have a balcony, great deck railing ideas that will keep the area open include ranch style rails, large spaces between posts, or wooden rails with thin metal balusters.